Writing this essay made me sad. I had come across a group of self-assured philosophers, singing the praises of Kant. That was a moment of solitude. Sheep praising the wolf. When I brought up objections, pointing at the enormous connection between Kant and Nazism, I was haughtily told “We, in philosophy, do not judge thinkers on one sentence”. In the Twelfth Century, Saint Bernard (de Clairvaux; Abelard’s, and humanity’s, enemy) was asked how he, the saintliest and most influential Christian (he told Pope Urban II what to do), could defend homicide. Saint Bernard haughtily replied: ”It is not homicide, but malecide, the killing of evil.” Bernard, one of the known universe’ most evil men, then launched the Second Crusade, the Cistercian order, the Knights Templars, the Inquisition, and the killing of millions, for centuries to come. People who are viewed as philosophers, by a large following, have much more influence than is generally attributed to them. Some are anti-philosophers, those who give guidance, honor and cover to the satanic minds who grab power and lead civilization to the abyss, driven only by the greedy instinct of the self-destructive predator. Locke helped slavery. Rousseau, Kant, Herder etched in the stone of (pseudo) philosophy the erroneous systems of moods and thoughts which brought Nazism. Yet, they still have lots of cognitively impaired followers. Truly these guys are not philosophers, but plutocratic puppets. That makes them all the more dangerous. How does one subjugate people? By making them feel wrong. Then it is easy to make them think wrong. In the end they believe it is smart to engage in whatever will and up oppressing, or even, could destroy them. In the philosophy of the predator, destruction, whether means, or end, is an intrinsic good. The archetype modern example here is Prussia, and the fascist, racist, anti-Judaic Nazi Germany it ended up creating… bringing the annihilation of Prussia. The Germans, under the influence of a triumphing Prussia in the Eighteen, and Nineteenth Centuries Century, were led to believe it was smart to dislike, despise, hate, oppress, subjugate, exploit, dehumanize, Poles, Slavs and Jews. Superficially, it worked. Until September 10, 1914, when the all devouring Frankenstein of Prussian racial fascism had to beat a hasty retreat on the battlefield. Thus a mood of exploitative racism and hungry military aggression was created by Prussia’s masters. All they needed were parrots to sing their praises. And they were many, the most prominent of these birds repeating songs of evil was Kant. Now for some comic relief. It turns out that Kant is still much admired, 70 years after his followers exterminated tens of millions of innocent civilians (they wanted to do more, but they were rudely interrupted by carpet bombing). How was the mood created? In no small part by making people admire a pseudo-philosopher, Kant. Kant was racist, militarist, mechanical. A perfect philosopher for a racist militaristic regime. In other words: dictators (=”highest legislators”) rule, disobeying them is immoral. That could only please Kant’s paymaster, the hereditary dictator of Prussia. Remark: This, that resisting the dictator is immoral, nothing new: I call that the Qur’an Fascist Principle (Sura IV, Verse 59). This is the essence of Hitler’s Fuhrer Prinzip. Kant was just a guy who heard about the Qur’an. This makes Kant vastly inferior to Voltaire. Voltaire read the Qur’an, and dragged the emperor of Mecca, Muhammad his name, it in the mud, to the point that the Politically Correct censored him, in the Twenty-First Century (!) Voltaire was right, so he gets censored, Kant is a Nazi, so he gets lauded. In a world where human values are inverted, a plutocratic world, in other words, this all makes sense. For comparison, Rome had African (Libya), and Arab emperors (or “Augusta”). Rome happily mixed all races. Johann Herder (1744-1803) quoted Kant’s lectures on practical philosophy: “Every coward is a liar; Jews, for example, not only in business, but also in common life.”… Nazis made a “hideous misinterpretation of Kant”? Or is it that some people are just hideous stupid? In other words, Kant is the perfect philosopher for weak-willed idiots. All the more as he invented a weird, pseudoscientific jargon which appeals to those who find too difficult to learn true science, the uneducated and unintelligent. Hence said jargon became wildly popular with philosophically inclined half-wits. Tolerating Kant, is tolerating Nazism. Adulating Kant, is adulating the essence of Nazism. Time to get acquainted with those facts. Indeed, plutocrats do not have much too fear, besides snow storms, as long as those who view themselves as “philosophers” drink the cool Kant aid. This entry was posted on October 21, 2014 at 11:48 pm and is filed under Ethics, Fascism, Intellectual Fascism, Nazism, Racism. You can follow any responses to this entry through the RSS 2.0 feed. You can leave a response, or trackback from your own site. Very enlightening. I always thought Kant was a kind of Turing Test, a machine trying to sound human and completely failing. Now you expose the machine’s murderous programming and its consequences. I was brought up in fond awe of classical philosophy. Socrates was extolled as the highest ethical voice in centuries when he told his friends that he would not try and escape his (unfair) sentence, because the harm he would do to laws would be much worse than the harm he would be spared. If he said that (we have to believe Plato) he was indeed commendably ethical at his own expense (although his sentence was justified on several counts; I take him to be a sophist, a capital offense). So we can excuse him on grounds of misplaced honesty. With your attacks on the Pluto Troïka and Kant, you’ve been helping me crystallize my deeply felt mistrust in those luminaries of my youth. Classical studies, touted as the means to build free souls, actually were the reverse. Another example is the veneration for Cicero, a two-bit mouthpiece (aka lawyer) for his plutocratic employers, and the accompanying hatred for populist activists of his time, including Catilina or Caesar himself. Dear Dominique: Thanks. I doubt professional philosophers will find this enlightenment so endearing. It has long been clear (to me) that the most respected philosophers in the Anglo-Saxon universe, are all trash cans. Agreed to all. I had a similar trip myself. I went from veneration of the SPA troika to increasing suspicion. Now I view them part of the plutocratic mindset, like the Qur’an which they preceded by a millennium, and enduringly popular precisely because of that. When one knows the broader ethical and historical context around Socrates, he does not look good at all. Yes, Cicero by dealing with the Conspiracy of Catalina the way he did, an act of pure free will, not just followed Aristotle closely, but buried the Republic. That, too, nobody ever says, instead focusing on Caesar… When Caesar, clearly was stuck between a rock and a hard place, and, roughly, at least in its later years, tried his best. Andrew Tripp: Patrice, way to ignore the fact that your example ignores that they hideously misread Kant. There are many selfish and narcissistic utilitarians, so does that bury utilitarianism? What’s wrong with the statement that the Nazis adapted a misinterpretation of Kant for their own purposes, as they did with Nietzsche? Any surface level knowledge of Kant and of the Eichmann trial reveals that. Patrice see that’s why in philosophy we don’t rely on single sentences to sum up entire thinkers. There’s a whole ocean of context to that quote, and Kant’s views in general, that are necessary for understanding him. Saying Kant’s philosophy is compatible with Nazism based on single quotes is just plain bad faith arguing. Andrew, Hideously misinterpreted jargon? Because Kant is all about pseudoscientific JARGON, indeed. Gee, how surprising! Kant’s jargon was made to be abused, or more exactly, to abuse people with. Nazis did not use Goethe, Schopenhauer, or Nietzsche as a defense, when on trial (although Hitler tried to use Nietzsche, he grossly failed). When on trial, Nazis used Kant. Why? Kant was a fascist compatible philosopher (like Herder). 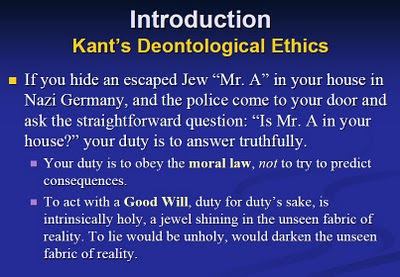 Kant defines virtue as “the moral strength of a human being’s will in fulfilling his duty” Suitably murky. Moral strength, very Kantian indeed. Yes, scary, indeed. That’s the difference between a people brought up in a democratic spirit, and those brought in a system where the big decisions are taken by someone else. As an aside – the Wehrmacht Code of Conduct did include the formal right for officers and soldiers to disobey an illegal or criminal order. Hundreds of officers were court-martialled for exactly that, and let go by the military courts. Of course their later career was short-lived and snowy, but so was that of a lot of their more obedient brothers in arms. The urge to obey was an inner one. Dear Dominique: Once again you faites preuve of your remarkable knowledge… I read about 150 cases of refusals to execute criminal orders that were striking enough to deserve formal military court. However the politicians, that is, the higher-up Nazis, gave orders to the judges to not prosecute a single one. They were afraid that the defendant would win, and thus open the floodgates of a rebellion against Nazi criminality (as happened in Spring/Summer 1944). I presume you are the dimwitt Patrice alluded to? Just one of them, there was a whole crowd of them. Stupidity is stronger, en masse. This all started with the evil English philosophers, Locke, Hume… And Rousseau, as you said. Rousseau made the first direct secular attacks on civilization.